Networking is an art and a skill. It’s an easy skill to learn but a difficult art to master. The simplicity of networking is that there are ample opportunities available, whether in your community, your company, or your industry. In fact, every time you meet with anyone, you’re basically networking whether or not your realize it or take advantage of it. What is needed is to learn to employ the right strategies to get the most out of each engagement. Do carry a lot of business cards to pass out at social, business, and networking forums. This will allow for future follow-up opportunities and by exchanging cards with others, you won’t have to be surreptitiously taking notes the whole time in order to remember contact information. Do dress appropriately for the situation. A business dinner requires formal business attire, whereas a public event or a social setting might only necessitate smart and casual. Don’t forget to wear your most important accessory – a calm and smiling face! Make an effort to look and appear approachable. If you are always on the phone at the event, not much networking is going to happen so keep your phone on silent for awhile and direct your important calls to someone who can attend to them while you are busy. Strike up conversations with people you do not know by seeking out common interests and gradually steering the topic to your business or your personal brand pitch. It is important to have a one minute personal brand statement ready for these types of events. The statement should be simple, honest, concise, and well-rehearsed, without sounding scripted or memorized, of course. If you are presented with an opportunity to speak with a hiring manager of a company you want to work for, or with a prospective new client, it pays to be prepared and able to express yourself and your brand quickly and succinctly. Send a polite “nice to meet you” note within 48 hours of having met a person (this being another important reason to exchange business cards). Make a note of who the person was and what opportunities may exist with that person. If your email is not acknowledged or answered within a few days, try following up, but as you don’t want to appear desperate or aggressive, if they do not respond after 2-3 attempts, it’s best to slip the contact into your “do not contact” category and move on (perhaps looking to meet up again at future events). Do not spend more than ten minutes with one person; that should be sufficient time to know if your contact has the potential of being a long-term connection or not. If the conversation is dragging and has long pauses, politely move on and seek out others. However, if the conversation is going well and you are enjoying the direction it is going, agree to meet up at a later date, in a venue more conducive to serious and in-depth topics. Don’t do all the talking, especially if you find yourself talking mostly about yourself. On the other hand, don’t continue a conversation that appears to be dragging on, with long uncomfortable pauses. Remember that networking is not a job or something to check off your to-do list. 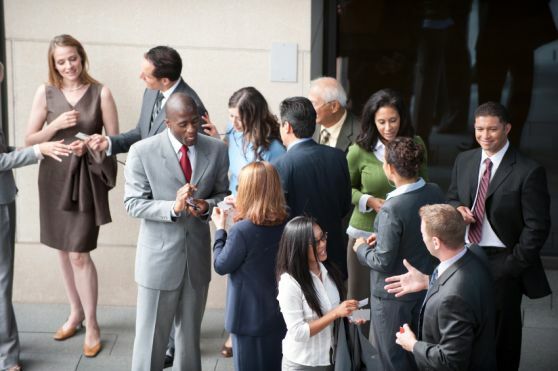 When you interact with people at these events, it should not appear that you are just going through the motions and you should never give the impression that you’re just in it to take from everyone else for your own benefit. Network to help out others as much as you want them to help you. This entry was posted on Wednesday, February 6th, 2013 at 3:55 am	and is filed under job search. You can follow any responses to this entry through the RSS 2.0 feed. You can leave a response, or trackback from your own site.